Zavelu is a fruit from Central Africa. 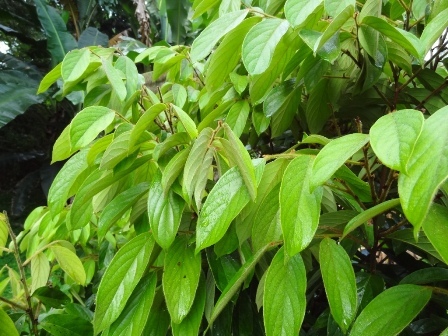 It is found growing in Congo and the surrounding countries. It is a rainforest tree. Zavelu trees bear quite unusual fruit which are covered by a dense mat of irritant hairs. Fortunately, the hairs loosen when fruits ripen and thus it is possible to handle the ripe fruits. 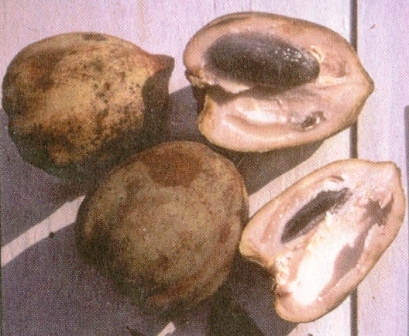 Seeds of zavelu are eaten and liked by gorillas. A tall tree, about 30m high, branching habit is symmetrical (whorled) at various levels. Leaves ovate, acuminate, 12cm x 5cm, and hairy on the leaf surfaces and stems. Fruits large, 10 cm in size, nearly round, with reddish, irritating fine hairs covering a yellowish-green thin skin.. Around each seed is a 2mm, almost clear, gelatinous aril. Filling out the rest of the fruit is a starchy, white, somewhat flaky pulp that is consumed along with the aril. Fruits are eaten fresh. However, one must take care while opening the fruits as the tiny red hairs on fruit surface are prickly and can be painful if enough of them stick into you. The hairs can be removed simply by rolling the fruits on the ground or by rubbing them off with a leaf. Then, slice the fruit open into sections, each section containing one seed. Eat all the flesh and the aril around the seed. Discard the skin and the seed. The taste in incredible, like eating cantaloupe pie. The flaky starch flesh is bland, but sort of buttery in texture. The gelatinous aril is what gives the definite cantaloupe flavor. According to fruit loving foreign visitors, eating zevelu fruits is like eating a pie made from cantaloupe and durian. 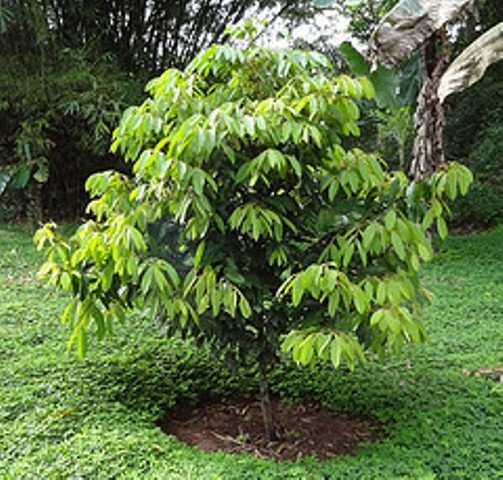 As zalelu is a sub-story tree of the rainforest, it is probably tolerant of a lot of shade and probably requires much of it in its early years. It does well in different soils, but fertile, moist ones are best. As it is a very slow growing tree, so it takes long, upto 10 years for coming into bearing. According to local Congolese fruit experts, zevelu tree produces a good crop only once every three years. New plants can easily be raised from seed. Asexual propagation has not been tried, but asexually propagated trees may come into bearing in much less time that is taken by seedlings. Trees may be planted under medium shade 8m apart. Provide sufficient water and organic matter where possible.